Last night my 2&1/2 yr old son sat with me at our farm table while I chopped veggies for chicken soup, sampling and asking me the names of the ones he didn’t recognize. This was a first for us b/c he finally has the attention span fit this kind of leisurely activity AND enough teeth for raw veggies! But it was just another reminder that cooking as a family is so beneficial to our hearts and lives. And I totally advocate one-dish dinners. They give us the opportunity to spend more time eating and less time doing dishes. Some of my favorites are roasted chicken and root veggies (all in one pan), then use the leftover chicken the next day for soup (can be made in 30 minutes with an already full flavored, precooked carcass), and bruschetta with fresh mozzarella on toasted baguette. Oh, the other positive of alloying for cooking time in our very busy schedules: we learned my son LOVES cooked celery. And any time I can add a Love veggie to the list, that’s success in this house. Thank you for your comment Erin. I love the “love veggie”! Katherine! It was so lovely to meet you at Harriet’s, and I am glad to have found your blog! I am a huge proponent of one dish meals plus a salad/veggies/whatever I have around, but I am definitely going to use your idea of freezing leftovers so I don’t get sick of them! I made a really good curried lentil dish that I ODed on and never want to eat again, and also there are some nights when I am happy to spend 2 hours in the kitchen and other days when even 1o seems too long. having homemade options ready to go would make those nights easier. Great to meet you too Hannah. Good luck with the Bon Appetit gig and I look forward to staying in touch. Still dreaming about your chocolate cake! This is an interesting topic and near to my heart. My situation is certainly different than that of most of your readers but I find cooking to be a lovely theraputic alternative to my other work. I remember back to child rearing days when all my work seemed to be never ending repetition – diapers, laundry, cleaning up the house etc. Done just in time to start over again. Somehow cooking a decent meal has a beginning and an end and you feel you have “made” something and all the eaters are happier and healthier for it. Sometimes these days they even say “thank you”. I think a similar kind of satisfaction to that which we get from sewing an article of clothing, writing a letter or finishing a scrapbook can come from those simple good suppers. We are blessed to have so many wonderful ingredients to choose from. What if we had to make do with just beans and rice EVERY DAY? And now for that letter to the County about Weyerhaeuser wanting to develop “under producing” forest land and lunch for the crew. Thanks for this Katherine. It is perfect timing for me as I am going to start taking Emma off of wheat. I am looking for non-wheat meal ideas and this looks great. Do you have any suggestions for non-wheat baking? Have you made the no knead bread with spelt or other flours? Once again, I love your blog! Happy New Year. I am now a complete convert to the one dish with egg and bread meal plan! Just whipped up your cannelli bean soup — so incredibly tasty and actually do-able at the end of a long day… My 18 year old was craving “real food” and tried to get me to make some complicated thing from Cooks Illustrated Best Recipes , but I talked her into your recipe instead — she started out with “boy, that smells good” , followed her first taste with “this is really different and really good” and ended with “that was fantastic, thanks so much for making”! Thanks for making me a kitchen hero, and for bringing so many new and wonderful flavors into our lives. God(dess) bless veggie boullion! Thank you SB! what a lovely comment and hurray for Lauren liking it too! This is a timely post for me. My down-time and the time when I’m most intensely “working” for my family is all related to food. I’m a stay-at-home mom with a 2 y 8 m old, and I’m 6 1/2 months pregnant with TWINS. Oy. I actually write my menu and shopping list for 2 weeks at a time, and shop for everything once, just picking up odd items here and there in between. This is a plan that works for me. I make plenty of one-dish meals, and plenty of 3-piece meals with soup and cake, too, so I’m kinda all over the map. But NOW, I’m trying to avoid being put on bedrest, and need to cut WAY back on the time I spend on my feet, most of which is time in the kitchen. OY. So, this time, I put quickie items on my dinner menu, like tacos, or other meals that take a little more time, but either result in left-0vers to be eaten on a subsequent night or mostly unattended time. The kitchen has always been my sanctuary, and it is VERY challenging to think of myself as doing less. I guess that’s just a rambling note, but somehow it seemed tied-in to your subject. Also, my daughter’s not quite *helpful* to me yet in the kitchen, but we always make applesauce together, and when I make pizza, I tear off a little piece of dough, and let her make her own, with plenty of supervision, or she’ll help me dump ingredients into a pot or the food processor. She ALWAYS wants to help, so YES! Doing something right. 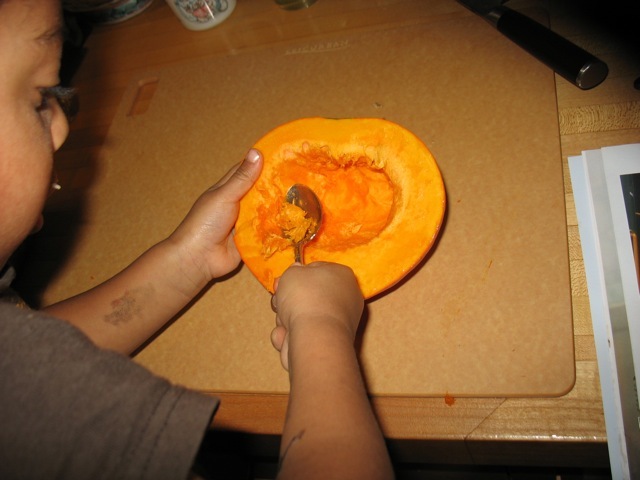 Get those kiddies into the kitchen, help them develop a love for feeding themselves GOOD food and feeding others, too. Nothing better. Your latest post resonates with me! My mantra is : cook once, eat at least three more times. Spaghetti, tacos, soups, and baked chicken are my mainstays. 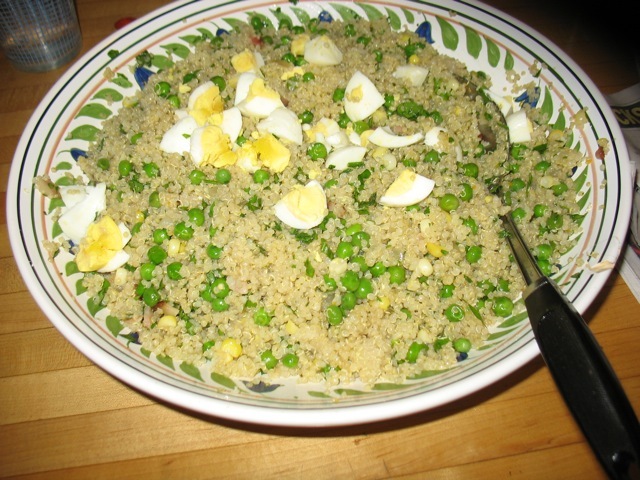 Usually our meals are rounded out with a green salad, of which I make enough for three days. Our family is fine with eating the same thing more than once a week, and two times in a row is okay, too. I enjoy your recipes, kitchen wisdom and wonderful outlook. Thanks for all your efforts. I really must try a pressure cooker some time. I keep hearing wonderful things about them and at 92 I’m taking your advice very seriously!